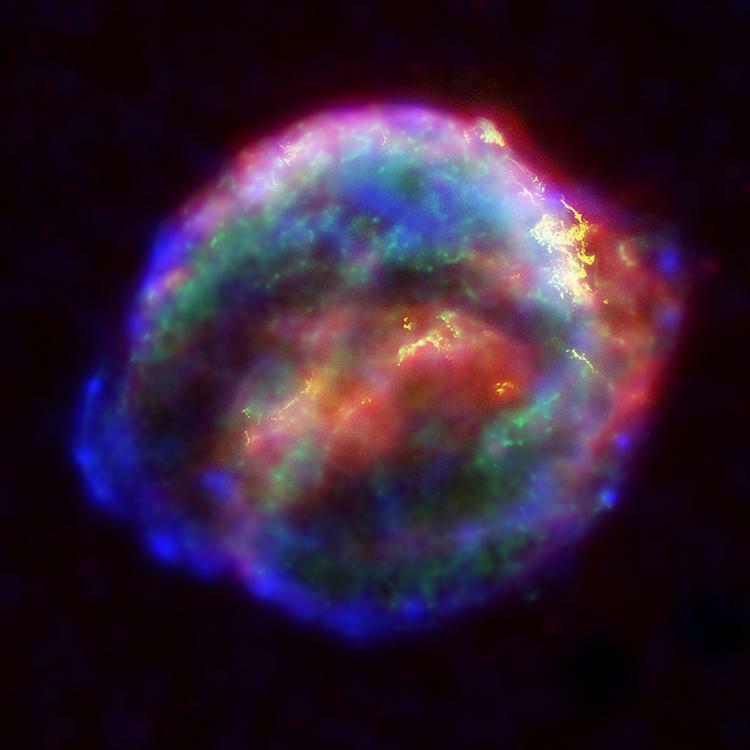 NASA's three Great Observatories -- the Hubble Space Telescope, the SpitzerSpace Telescope, and the Chandra X-ray Observatory -- joined forces to probe theexpanding remains of a supernova, called Kepler's supernova remnant, first seen 400 years ago by sky watchers, including astronomer Johannes Kepler. The combined image unveils a bubble-shaped shroud of gas and dust that is 14light-years wide and is expanding at 4 million miles per hour (2,000 kilometersper second). 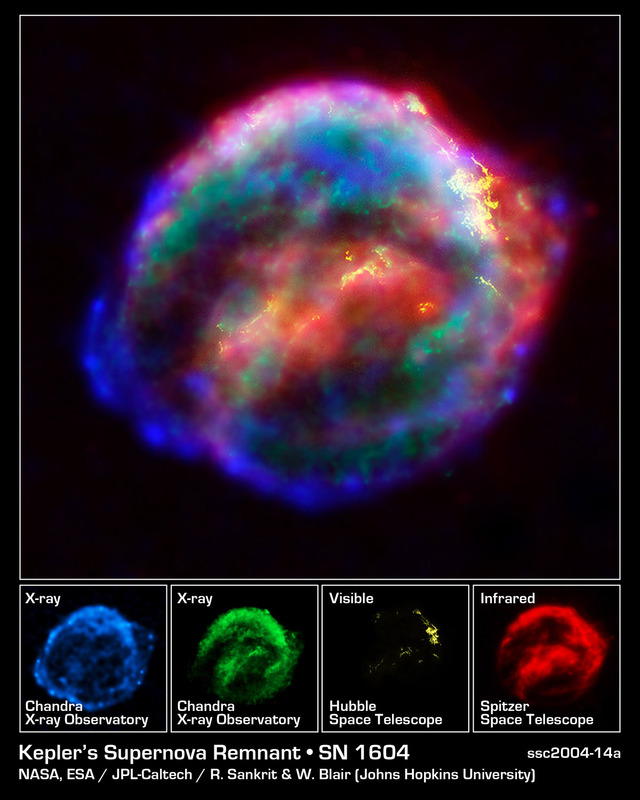 Observations from each telescope highlight distinct features of thesupernova remnant, a fast-moving shell of iron-rich material from the explodedstar, surrounded by an expanding shock wave that is sweeping up interstellar gasand dust. Each color in this image represents a different region of the electromagneticspectrum, from X-rays to infrared light. These diverse colors are shown in thepanel of photographs below the composite image. The X-ray and infrared datacannot be seen with the human eye. 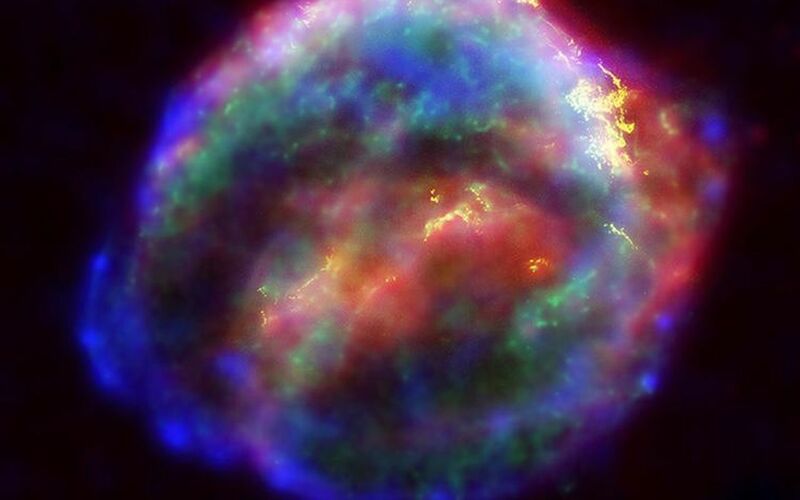 By color-coding those data and combining themwith Hubble's visible-light view, astronomers are presenting a more completepicture of the supernova remnant. Visible-light images from the Hubble telescope (colored yellow) reveal where the supernova shock wave is slamming into the densest regions of surrounding gas.The bright glowing knots are dense clumps from instabilities that form behindthe shock wave. The Hubble data also show thin filaments of gas that look likerippled sheets seen edge-on. These filaments reveal where the shock wave isencountering lower-density, more uniform interstellar material. 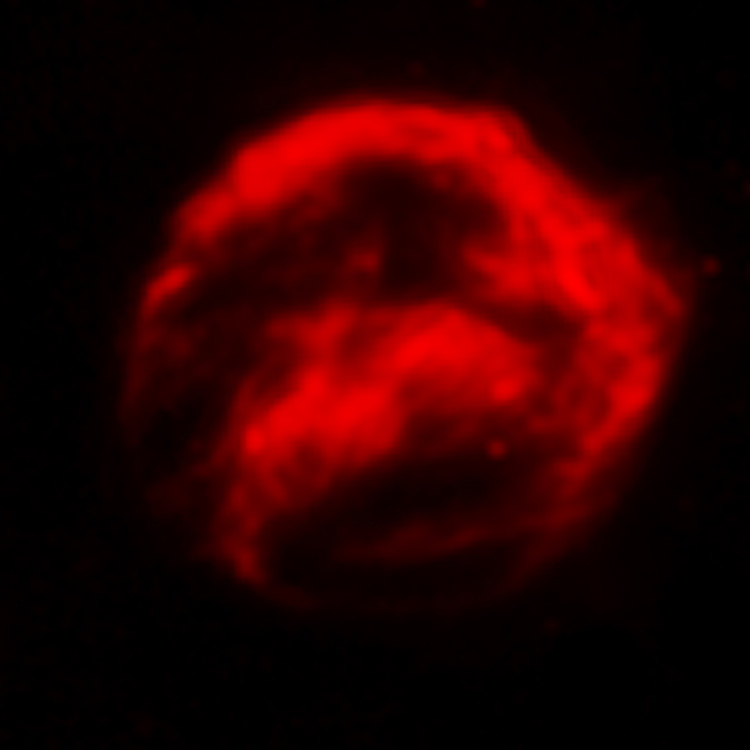 The Spitzer telescope shows microscopic dust particles (colored red) that havebeen heated by the supernova shock wave. The dust re-radiates the shock wave'senergy as infrared light. The Spitzer data are brightest in the regionssurrounding those seen in detail by the Hubble telescope. The Chandra X-ray data show regions of very hot gas, and extremely high-energyparticles. The hottest gas (higher-energy X-rays, colored blue) is locatedprimarily in the regions directly behind the shock front. These regions alsoshow up in the Hubble observations, and also align with the faint rim of glowingmaterial seen in the Spitzer data. The X-rays from the region on the lower left(colored blue) may be dominated by extremely high-energy electrons that wereproduced by the shock wave and are radiating at radio through X-ray wavelengthsas they spiral in the intensified magnetic field behind the shock front. CoolerX-ray gas (lower-energy X-rays, colored green) resides in a thick interior shelland marks the location of heated material expelled from the exploded star. 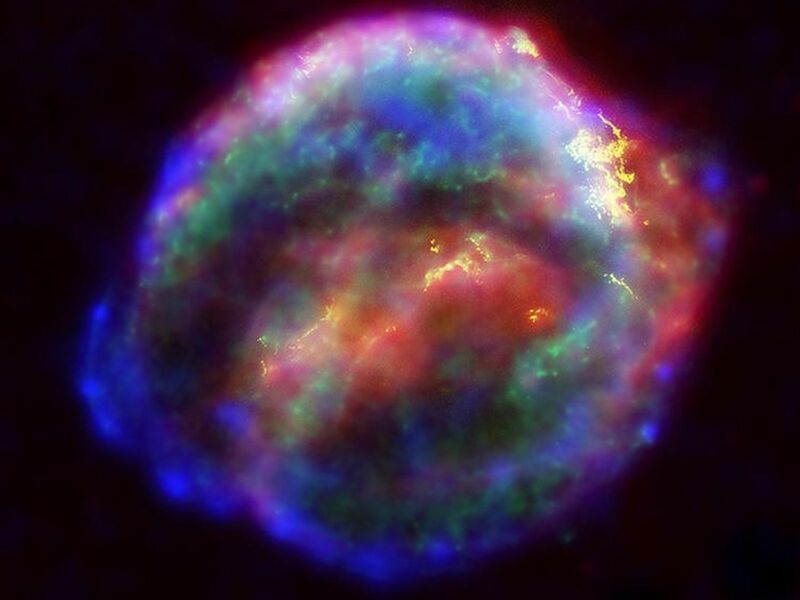 Kepler's supernova, the last such object seen to explode in our Milky Waygalaxy, resides about 13,000 light-years away in the constellation Ophiuchus. The Chandra observations were taken in June 2000, the Hubble in August 2003;and the Spitzer in August 2004.